Picturizer is a subscription service for digital images. Enjoy a setup that gives you access to an entire universe of photography. Picturizer will help you put the works of the greatest photographers and artists on your walls. With photography, digital art or cinemagraphs, you will be able to create the perfect atmosphere for the living moment. Based on your specific needs and wishes, we offer thematic curation for your business. And your images can of course be updated as often as you wish. We offer strong, captivating single images. We also curate series of images that tell a fuller story, set the atmosphere and tie the room or your entire premises together. You can change the ambience of your premises at lunchtime, at night or whenever you like. Image transitions can be scheduled or made manually. We enhance the experience by presenting background stories on photos, photo shoots and photographers. The Picturizer curators hand-pick images from some of the greatest professional photographers and artists around the globe. We cater for a wide range of photograhpy: from documentary to fine art, from landscape to fashion. The Picturizer catalogue consists of outstanding photos with the potential to surprise and tell a story. Our network includes established photo agencies like Magnum Photos and Agence Vu as well as up-and-coming talents. The ultra-HD screens have handcrafted wooden frames that make them stand out as works of art in their own right, but the real magic lies in the intelligent features of the service. Control your images from your laptop or from your smartphone. You can make changes to a single frame, a single location or update all images everywhere. The screens – your own or the framed screens that we supply – are powered by an intelligent image computer, WIFI-connected to our service. Display great images on any digital surface, design the ambience and turn your walls into dynamic tools for the visual impact of your company and your brand. 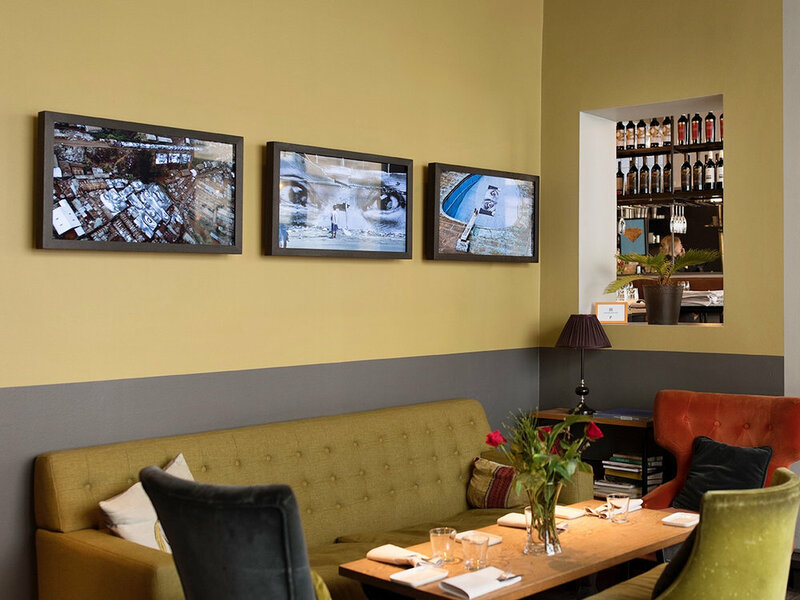 Cultur Bar mixes great food and art in a relaxed atmosphere. Picturizer suggested three frames as a mini exhibition on a wall clearly visible from the pedestrian street outside. Early projects were French artist and photographer JR’s Women Are Heroes and Jens Andersson’s Slussen. One of the projects was on show during the day and the other one in the evening. The busy hotel liked the idea of a fresh and dynamic decoration solution for their reception area, to greet the wide variety of international guests. An initial journey theme stretching from Hong Kong harbour via the rooftops of Paris to chilled out skating in Valencia, has lately been replaced by a captivating study of the Nordic forest by renowned photographer Vincent Skoglund. The two custom-made frames on the wall behind the chef build on the Japanese design theme in this small but acclaimed sushi restaurant. 18 pairs of photos range from everyday life street scenes in Tokyo and Gose to early morning in Tjukiji fishmarket and rice polishing. By changing images three times a day, we make sure that even the regulars are met by new photos. Sign up here and we will keep you updated.